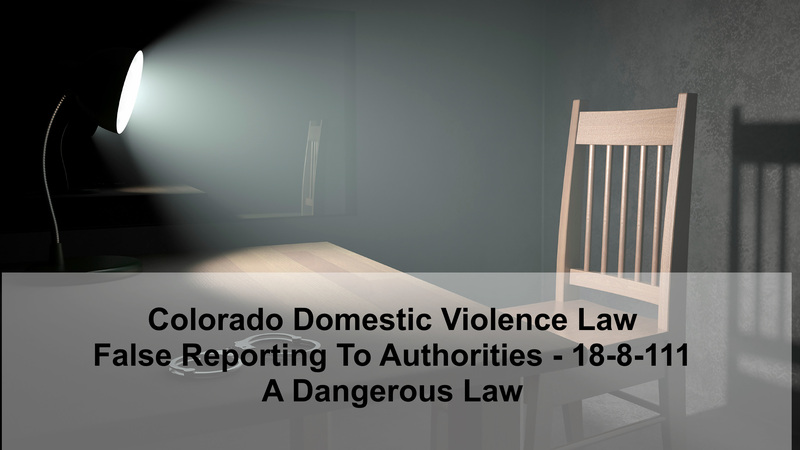 Colorado Domestic Violence Law - False Reporting To Authorities - 18-8-111 - A Dangerous Law - Denver Criminal Attorney Specializing in Domestic Violence Cases - Colorado Criminal Defense Lawyer. 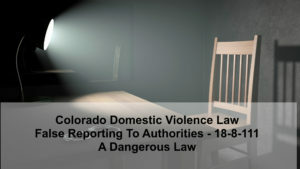 Colorado Domestic Violence Law – False Reporting To Authorities – 18-8-111 – A Dangerous Law – Colorado domestic violence cases often involve alleged victims of domestic violence who decide, after reporting an alleged act of domestic violence to the police, to retract or “recant” their original complaint. When this happens the alleged victim runs the risk of being arrested and charged with the crime of False Reporting To Authorities. (2) …False Reporting can also be charged as a class 2 misdemeanor if the Defendant deliberately causes an alarm to go off while committing another crime. (Between 3 to 12 months, and – or a fine of between $250 to $1,000). Colorado domestic violence cases are primarily filed as misdemeanors. This means that the police officer who investigates the case and makes the arrest – files the case directly with the court. Only later is a District Attorney assigned to the case. In many of these cases, the “accuser” may attempt to recant her (usually a woman) story. In making the decision to recant, the alleged victim runs the risk of facing charges for making a false police report. False reporting is the affirmative act of lying to the authorities. It is important to point out forcefully here that there is never a legal requirement to speak to the police. Every citizen has the right to remain silent and while the law does require that a person provide to the police their real name and other identifying information, a person can thereafter decide to remain silent …at any time during the investigation. Under Colorado Law – “Identifying information” means a person’s name, address, birth date, social security number, or driver’s license or Colorado identification number. If a citizen decides to talk, what they say, especially these days, may be recorded on body cam without their permission and later may be used not only against the accused and ALSO against the “witness” in a False Reporting case. turned Defendant. Conversations with the police and with District Attorneys are always fraught with danger. What a person says to the authorities can be turned around and used to charge that person. In a nutshell, while a person always has the right to remain silent when speaking to authorities, should that person decide to talk, they are required to tell the truth. I believed I was telling the truth in my first statement. The police misunderstood what I was telling them. While I may have lied, the lies were unimportant and – or not relevant to the charges. I was so drunk or high (or both) that any statements I made were not intended to be false. False reporting requires that the person making the false report know that the report they are making is false. 6. when he [she] knew the crime or other incident did not occur. One clear line of defense to the crime of false reporting is that the Defendant believed their report was genuine at the time. The Colorado criminal defense lawyer who represents the Defendant in an attempt to have criminal domestic violence charges dropped, cannot also represent the alleged the victim in an attempt to change her statement or to otherwise have the case dropped. For many reasons, including the issue of the danger of possibly being charged with false reporting, the alleged victim should have his or her own attorney separate from the defendant’s attorney. Ethical concerns include the “appearance of impropriety” if the same lawyer attempts to represent both individuals. 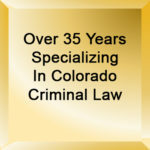 On the other hand the attorneys are legally permitted to work together and while two separate attorneys may not mean guaranteed success in having the case dismissed, such a situation has a far greater chance of achieving the best result in a Colorado domestic violence case – especially if the charges are of the most serious kind. While being charged with a criminal case such as False Reporting in Colorado can sometimes cloud your judgement – it won’t cloud ours…. if you under investigation or charged with the Colorado crime please don’t hesitate to call our firm for a free phone consultation. Colorado domestic violence cases often involve alleged victims of domestic violence who decide, after reporting an alleged act of domestic violence to the police, to retract or "recant" their original complaint. When this happens the alleged victim runs the risk of being arrested and charged with the crime of False Reporting To Authorities.